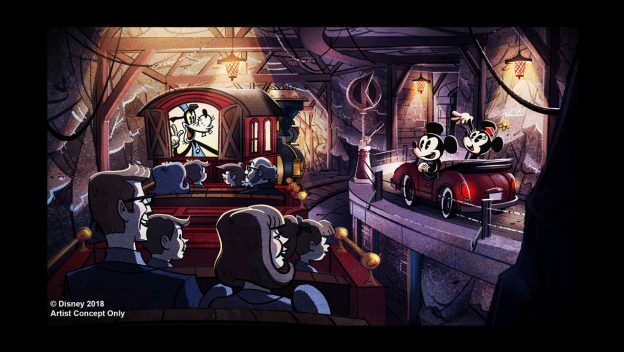 Disney has released additional information and images for Mickey & Minnie’s Runaway Railway which is opening next year at Disney’s Hollywood Studios. The attraction “will totally immerse guests in a cartoon world and will feature a new catchy theme song created especially for the attraction,” according to Disney. 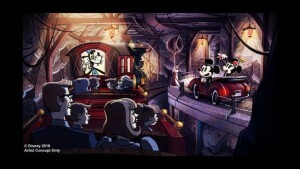 The ride begins with guests watching a new cartoon starring Mickey and Minnie as they prepare for a picnic. As they head out they pass a train with Goofy as the engineer. Then, guests “step into” the movie and the fun begins. Mickey & Minnie’s Runaway Railway opens in 2019 at Disney’s Hollywood Studios in the building the once housed The Great Movie Ride.